Lynchburg’s Master of Business Administration Program prepares you for leadership roles in the business field. Our program has a reputation for opening doors in the job market. Accredited by the Accreditation Council for Business Schools and Programs (ACBSP), our program provides in-depth knowledge of the business core: accounting, economics, finance, marketing, management, management information systems, and operations management. The Management Emphasis offers in-depth knowledge of the business core and covers topics in financial management, human resource management, information systems, and ethics. No previous business classes are required for admission. Cybersecurity jobs are growing at a much faster rate than average. Our program adds IT courses in cybersecurity to the business core, and no previous computer courses or experience is required for admission. Students will gain a broad understanding of all areas of business as well as the ability to solve real-world business problems. Our MBA students come with a wide variety of experience and from diverse backgrounds, including healthcare, small business, government, liberal arts, writing, teaching, and management. 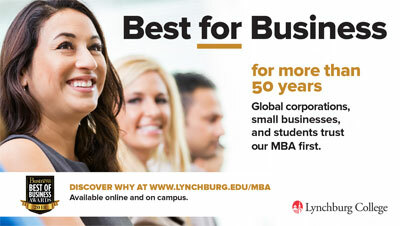 Take your career to the next level with an MBA degree from Lynchburg!